Part 1: "History of the Anthropoid: The Search for the Beginning"
"Part 1: Dr. Friedemann Schrenk searches for hominid fossils with famed paleoanthropologist Meave Leakey in East Africa. 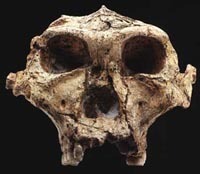 At excavation sites in northern Tanzania, Leakey discusses four-million-years-old findings and traces their relationship to previous findings-Lucy, an Australopithecus afarensis skull found in Ethiopia; Nutcraker Skull, an Australopithecus boisei found in East Africa; and the skull of Homo habilis discovered in 1964. These and other skulls are analyzed within the context of the major evolutionary theories." Part 2: "Origins of Homo Sapiens: East African Roots"
"Part 2: Dr. Friedemann Schrenk, a German paleoanthropologist, "travels to several cave sites in Africa, to the laboratory of a South African paleoanthropologist who reveals information gathered when South Africa was out of touch with the world scientific community, and to the United States to study hominid remains." As you view the videos pay attention to . . .
With Australopithecus africanus we don't find Broca's and Wernicke's areas in the brain. But the brain is bigger than that of an ape. How did the Taung child die? Does short intestines and the use of fire yield "leftover energy" for the brain to use? "In most mammals energy is made to operate the intestinal tract." role of scavaging, includeing habits of hayenas, vultures, etc. "Cause and effect in evolution often depend on coincidence." Why are the bones from Makapansgaat black if not burned by fire? Why do bones become fossils at all? And in such number?